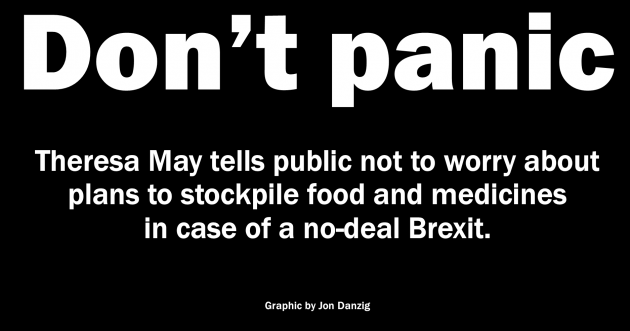 Our Prime Minister, Theresa May, has urged the public not to be “worried” by her government’s plans to stockpile food and medicine to prepare for a no-deal Brexit. She is taking us all for fools. ‘Utter madness’ is the appropriate description of what’s going on. When a former football player can say what’s happening but our political leaders cannot, you can tell that the country is in deep, deep trouble. 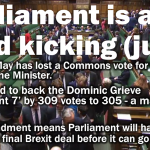 Theresa May has tried to play down the impact of the impending disaster that a no-deal Brexit means for Britain. Ms May confirmed that plans for stocking up on essential goods are underway – in case imports from the EU are cut off by clogged ports, or regulatory disputes. “Far from being worried about preparations that we are making, I would say that people should take reassurance and comfort from the fact that the government is saying we are in a negotiation, we are working for a good deal. Read her words carefully. She is giving the country reasons to panic, and at the same time telling us not to panic. We may not have enough food. Don’t panic! We may run out of medicines. Don’t panic! The ship is about to hit the rocks. Don’t panic! The ship is sinking. Don’t panic! Continuing to do the things that are necessary? Such as being able to eat food to enable us to live? Such as being able to get the medicines many of us need to stay alive or stay well? Mrs May says we should take “reassurance and comfort” from the government’s plans to save the country from a no-Brexit deal by ensuring we have enough food and medicines. The Prime Minister hasn’t a clue about offering “reassurance and comfort”. 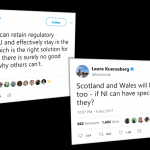 She was the Home Secretary who warned the country that Brexit was not in the country’s best interests. 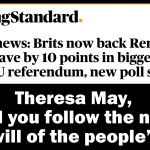 Then she volunteered to be the Prime Minister to do to the country what she previously said would be bad for the country. The only way to provide Britain with “reassurance and comfort” is to stop Brexit. It should be obvious by now that Brexit is doing huge damage to Britain before it’s even gone ahead. And if it is allowed to go ahead, it will inflict grievous injuries to our nation state and its inhabitants for years and decades to come. The workers at Honda and Airbus who voted for Leave are now learning that ‘Leave really means Leave’. Yes, those companies and many others are now preparing to leave Britain as a direct consequence of Brexit. Our economy needs frictionless access with our most important, most vital, and most profitable international market place – the EU. Without that, many of our most successful businesses in the UK cannot be profitable. They cannot survive here. Brexit cannot give Britain frictionless trade with the EU. How many times do we have to repeat that before it sinks in? Forgive the voters. 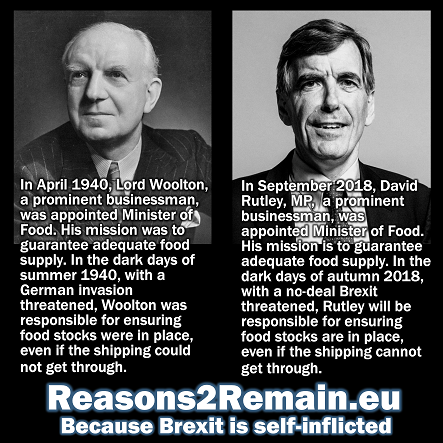 They could not have had any real idea that voting for Brexit would mean losing their jobs and result in shortages of food and medicines and the basics of life. Blame the politicians who sold the damned lies of Leave, and not the voters who unwittingly fell for them. But now we must wake up. We can’t trust those politicians who told us that Brexit would lead us to the promised land, only to take us on a journey to a barren Britain that’s impoverished, depleted and demeaned. Here, we warned the nation to see that Brexit would bring us pain. But now, we can all feel the pain – and feeling is believing. The only way to stop the pain of Brexit is to stop Brexit. Speak up. Squeal. Shout. Scream. Brexit is avoidable. But very soon – very, very soon – it will be too late. 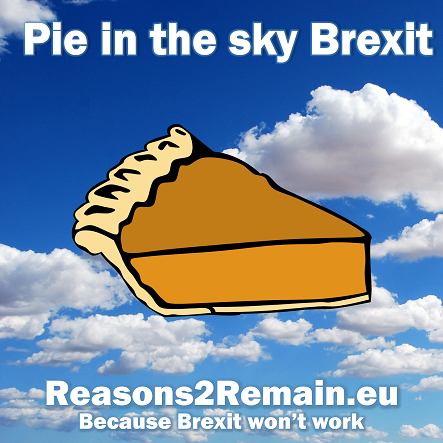 This entry was posted in Current Affairs, Democracy & Citizenship, Politics & Public Policy, The EU and tagged Airbus, brexit, food stockpile, frictionless trade, Gary Lineker, hard Brexit, Honda, medicine stockpile, no-deal Brexit, Theresa May. Bookmark the permalink.